Many visitors to Arrecife are often quite surprised to discover that the city has it's own beach, and although it is certainly not the best beach on Lanzarote, the El Reducto beach adjacent to the Arrecife Gran Hotel, has nevertheless been awarded the internationally recognised blue flag for its facilities, cleanliness, and water quality. Arrecife is the capital town of Lanzarote, the most easterly of the Canary Islands and as such is a bustling place with some great shopping, restaurants and galleries to visit. Close by, visitors will find a host of fantastic beaches with a great choice of water sports. For direct flights to Arrecife, Lanzarote from the UK, try Aer Lingus, Thomas Flights or Monarch. If you’re looking for low cost flights these are available on carriers such as Ryanair, easyJet and Jet2. With its natural harbour setting and year round sunny weather, Arrecife has much to offer its visitors. From here, why not take a boat trip around the island or spend a pleasant day walking around the port enjoying a spot of shopping or a bite to eat in one of the towns many cafes and restaurants. One of Arrecife’s most popular sights is the Castillo de San Jose which dates back to the 18th century and home to the Museum of Contemporary Art, where you’ll find works by Miro, Manrique and Picasso. If you’re after a good sandy beach to relax and enjoy the sunshine on then El Cable Beach and El Reducto are both close to the town centre, offering a selection of water sports, including windsurfing. For families, there are many popular attractions on the island to visit, including the National Park of Timanfaya with its beautiful plants and volcanic landscape or why not try the Guinate Tropical Park, a theme park for all the family to enjoy. 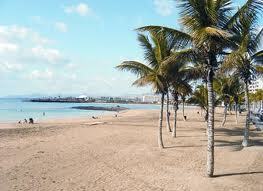 The cheapest flights to Arrecife, Lanzarote will usually be found out of season, avoiding the school holiday periods. You’ll find great offers on cheap flights and lastminute flights by taking a look at our flights search facility at Directflights.com. 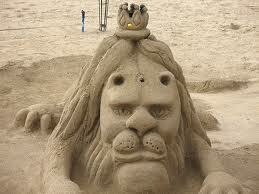 This is an all year round holiday destination having pleasantly hot summers and very warm winters. Arrecife is an ideal place for sun lovers. Lanzarote is by far the least mountainous of the Canary Islands and has a great deal of flat land. Due to this it is below the level of warm air and humidity. Mostly this results to a dry weather and very little rain. The average temperature in the summer is 27 degrees Celsius and in the winter still only 17 degrees Celsius.